Ricardo Abussafy de Souza is a post-doctoral student in the Graduate Studies Program in Social Sciences at PUC-SP (PEPG-CSO / PUC-SP). He participates in the Ecopolitics Project: planetary governmentality, new institutionalizations and resistance in the society of control”. He is a member of the Libertarian Sociability Center (Núcleo de Sociabilidade Libertária – Nu-Sol). This post belongs to the series Scenes from the Heart of Recycling. São Gabriel da Cachoeira is a city located in the northern part of the Brazilian state of Amazonas, about a thousand kilometers from the national capital. It is one of the largest Brazilian municipalities in square kilometers and has three official languages besides Portuguese (Nheengatu, Toucan and Baníua). Situated on the borders of Venezuela and Colombia, São Gabriel da Cachoeira is on the margins of urban structuring and development policies involving state and federal planning. 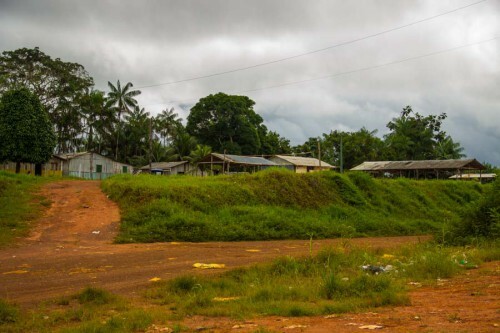 This city has a strong military presence due to its location on the border, as well as interests to “protect” the biodiversity of the Amazon rainforest. On the edge of São Gabriel da Cachoeira and next to the city dump, we can find the Ekatina Association for Recyclable Materials – part of the indigenous communityBoa Esperança (Comunidade Indígena Boa Esperança). 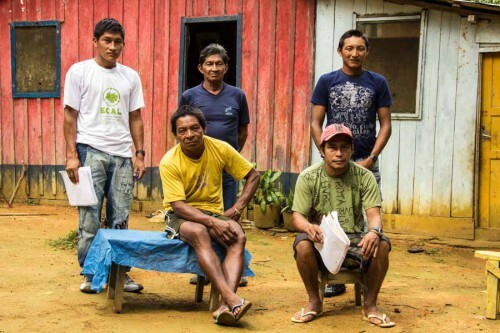 However, there is a stark contrast between this group and the Amazon itself, which is not only admired for its diverse fauna and flora, but has also been at the center of many discussions, disputes and problems. After working in the fields, the indigenous waste pickers hear the garbage truck arriving and run to pick aluminum cans out of the trash. 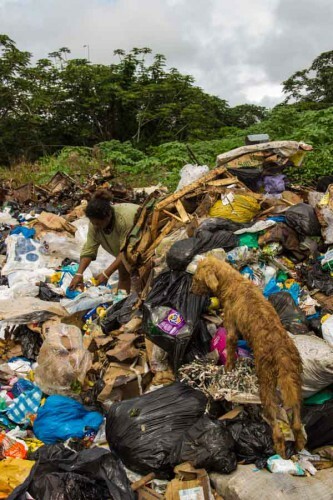 Sifting through food scraps from the city’s residences and military facilities, among mosquitoes and dogs, the Baré and Toucan Indians dig deep in the trash before the municipality burns whatever has not been picked up. The waste pickers walk 500 meters to get to their homes after collecting the cans – the only material with sales value. In order to sell the materials, waste pickers must take their collected recyclable materials by boat to the capital, a journey that can take up three to five days. They leave the landfill, but the landfill does not leave the community. The smoke from the garbage that the municipality burns sometimes invades the daily lives of the members of Boa Esperança community. Nausea and headaches are common among the families there. At a meeting with the Ekatina Association directors, the five waste pickers present talked about the warehouse, which is nothing more than a few beams that support a roof of zinc sheets. Under the roof there is an aluminum can press and a power box to someday be connected to the electricity which has never reached the community. The construction of the warehouse and purchase of equipment were managed by a local parish that raised funds for the association. However, the parish has never presented a report on those investments. A non-governmental organization from the state of Minas Gerais State that has been supporting the waste pickers in Manaus also visited the group, in addition to state representatives from the National Waste Pickers’ Movement (MNCR). In a meeting with the Municipal Secretary of the Environment, which only has a desk as part of the work space for the secretariat, said that waste management has been a pressing issue in the city, but it still does not have the necessary resources for dealing with the indigenous waste pickers. In contrast, the issue of the social inclusion of informal sector recyclers has been raised as a priority sine qua non in several national and international meetings on solid waste management. Huge investments have been made in different developing or underdeveloped countries. Although motivated by social discourses, the participation of waste pickers in solid waste management processes seems to only make sense if they have an economic relevance for the industries that are obligated to finance the recycling of their products post-consumption. Thus, these indigenous waste pickers are being prepared for a moment that is deemed more opportune for their inclusion. However, when will this day come? Will this only happen when some message or study on the economic potentials of this work makes it clear to higher levels of government or industries that it is worth investing in the collection of certain materials, despite the fact these materials are currently being burned in the middle of the Amazon rainforest and 500 meters from the Boa Esperança community? After several technical visits from the above mentioned groups, the Ekatina Association has been observed and monitored. In some cases, these groups are being regulated by productive organizations, reflecting new arrangements that go beyond the indigenous groups’ traditional culture. In many ways, these arrangements are attempts to bridge the urban and forest areas. However, these workers must wait their turn to be considered part of the agenda of social, environmental and economic priorities, which are influenced, in turn, by global and national agendas on sustainable development. Ekatina in nheengatu means joy. Nheengatu is a language developed from Tupinambá, which is spoken throughout the Brazilian Amazon valley to the borders with Peru, Colombia and Venezuela. The series “Scenes from the Heart of Recycling”, coordinated by Sonia Dias, WIEGO’s waste specialist, aims to highlight through short texts and videos the challenges that waste pickers around the world are facing today.